Last weekend, we put on a photo show based around the iconic Grant Brittain photo of Tod Swank pushing. Some of skateboarding's best photographers came out to showcase their pushing prints for the Push Photography Show - a fundraising benefit for Just One Board. Video by The Skateboard Mag. Skateboarder Magazine just launched a new website and their latest issue is FREE! be sure to check it out and download the entire mag for free. Taylor Smith destroy's it! Thanks to everyone who came out to the Push Photography Show on Saturday night. It was a complete success in raising money for Just One Board. Special thanks to our sponsors: Monster, Tusk and Grain, and TFR Gallery for hosting the event. 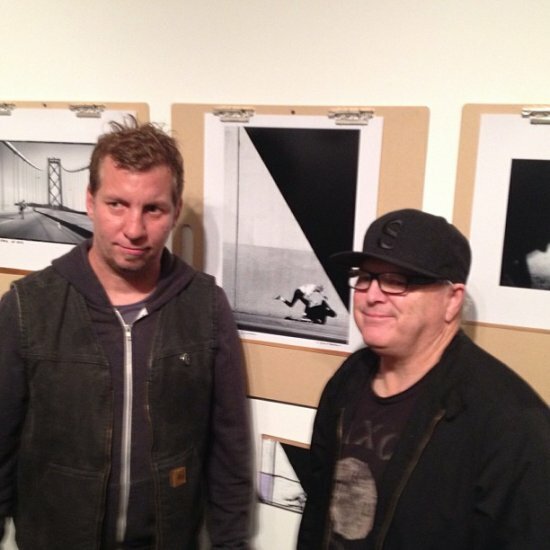 The entire Push Photo Show was inspired by the 1987 cover of Transworld Magazine and these are the men behind and in front of the camera of this iconic cover/photo. Tod Swank & Grant Brittain. Classic "Adventurer" re-issue coming in hot! In 1991, this 8.875x31.75, six color nose to tail graphic was a monumental achievement for the Foundation. The creme de la creme of skateboards! Pocket Cam 13 features: Leo Romero, Daniel Lutheran, Taylor Smith, Collin Provost, Matt Bennett, Pat Burke, Josh Harmony, Trevor Colden and Dakota Servold. Episode 13 travels through California, Tennessee, North Carolina and Arkansas. Sit back and enjoy some more wack angles and great times with the bros.